So it has been a moment since the last time I posted anything, really! Damn, its but less than three months before the year ends and I have not fulfilled my blogging promises. In any case, such is life, some plans tend to take a back seat to others, or are there even others. 'Nuf said! This post is about a really great project that some young Namibians have been working on. 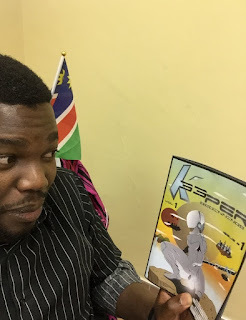 According to the Authors (Silas Nangolo Mentos and Shaimemanya Ndeutapo Kondjashili) of the Namibian comic book; Keeper (wish i could get the cool font here), they met at the defacto skate park in Windhoek - Augustineum Secondary School - things happened and the idea blossomed. The comic book has great artwork and I can say that I love it. Being that this is Issue # 1 and Vol 1 I think we have much to expect. Should I tell of what the contents are? Naah I think it best you buy a copy for yourself, it costs N$30.00, now that is a not even a bargain, its a freebee!! I hope they are not sold out btw!